Volume 11 "Teachers' Requests" is out now - in the Teacher's Set and on its own! Look at me! : Him, he, her etc. 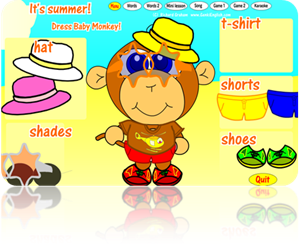 Summer Clothes : Plus "Don't forget your"
School Subjects: Along with "I like"
But it's not only audio tracks, you also have the funky PC / Mac software for each theme! The software is divided into different sections. Simply click the words or press the numbers 1 to 8 and hear each word pronounced. Each word is recorded with different people and different intonations to give the kids lots of English exposure. Here you have all 8 of the vocab words on screen at once. You can still move over them to hear them pronounced, and it is a life saver for classroom games. Plus if you use a projector in class, you won't have to carry around all the heavy picture cards! the kids become the center stage stars! Perfect if you're no good at singing yourself. Then the songs complete with lyrics and illustrations! A fantastic way to liven up the lesson and get the words stuck in your head. And a great way for kids to practice even when you're not there. All the themes also have funky computer games get the kids to race against each other! You could even use the games to "pre-teach" the new language to save more time for real practise with each other. Use the Words section for each theme you’ve previously taught to review the English. Plus sing the song from the previous lesson. Check out this video for how to get our kids really good! Now we use the Words section of the lesson we want to teach today. The trick here is to make it into a story e.g. asking the kids what they think your favourite subject is or showing them a picture of your Treasure Adventure and getting them to see what they can see. When they say something, that’s when you use the software to teach them it in English! Then use the Mini Lesson and finally the Song to get the English firmly stuck in the kids’ heads. This is what makes Genki English work so well! Now we use a classroom game to practice the English we’ve learnt. Have a look at the links at at the top of this page for pictures and videos! Final 5 minutes: End on a high note! Finally end on a big high note with another run through the song - if you have time! The ideas and songs you have here will inspire your students to try their very best to get fantastically good at English and be able to communicate with people around the whole world. Being a teacher is a special job, you are very special people. Your students are very, very lucky to have you as their teacher. You are their role model to guide them through the adventure called life, to give them the English and skills, imagination and confidence to let them make any of their greatest dreams come true. It’s an exciting time. The future is in your hands, we’re all here to support you. Try 100% for your students. Think “I can” and you can, if you lose, just try again. Enjoy yourself and above all …..
Only praise for you, Richard! Don’t ever stop!! These lessons are wonderful and I can’t wait to use them. 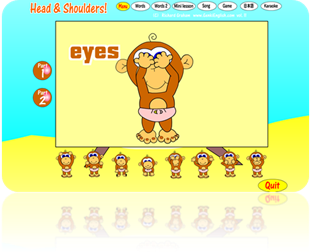 Baby Monkey has ALL the Genki elements that the children adore – what a treat this is going to be for them. They’ve always gone wild over Baby Monkey’s Winter Clothes and Rocket Launch so I’m sure they’ll take off with this one! 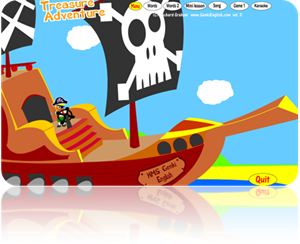 Treasure Adventure’s longer sentences will get the kids really talking and putting their words all together. 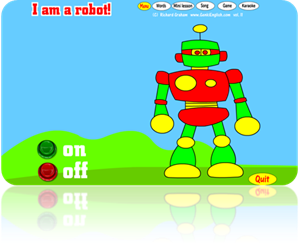 And the kids have literally been begging for I Am a Robot. I’m going to let them figure out for themselves its cool intuitive phonics game. 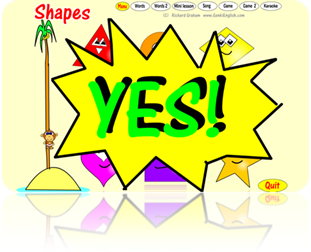 Look at Me is great and I love Lots of Shapes. Great music choices all around! And the kids are going to be rolling in the floor, then fascinated with your Head and Shoulders–thanks for the Japanese lesson here; and as for the Days of the Week–whoopee! Thank you so much! Bravo. Now I have to change my whole lesson plan for 2nd term. How the kids will go, when they see Baby Monkey on the screen! Richard, this is priceless. You really can’t ask me how much I would pay for it, really. 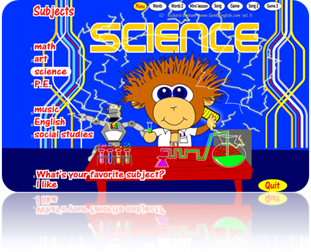 Hi absolutely love it… interesting subjects and fun songs… the kids are getting addicted! Keep it up – it is brilliant! I’ve been using your progrm for 3 and 1/2 years. Since I am not good at speaking, your program is really helpful. For this 11th volume, I really like the Subject song. I like the hip hop version. That will be good for higher grade but low level students. And you have mixed the ‘subject’ with the ‘Day’. I really like it. Hope you to mix other 2 subjects again. Thank you. What can I say Richard…! The kids will love it…Baby Monkey is a real superstar! 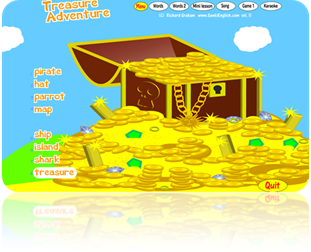 The treasure adventure is also fantastic to make illustrate and teach the phrase THERE IS A….. totally love it! Wow! These songs are great – thank you so much. Thanks again for this brilliant material! Hi Richard! We loved the robot song, we think it will be the best hit with I’m a super hero! Richard, this volume is amazing! I love the Baby Monkey and Pirate themes and the graphics are great. I also very much appreciate the longer sentences in “subjects” and “treasure” themes. Nobody else offers this kind of materials at your prices! I’m getting a lot of offers for “teacher guides with extra material” that are being sold for ridiculously high prices, and they certainly do not even come close to what you’re giving your members. Thank you, thank you, thank you Richard for these wonderful new songs, they are BRILLIANT! I can’t wait to show the kids these ones. 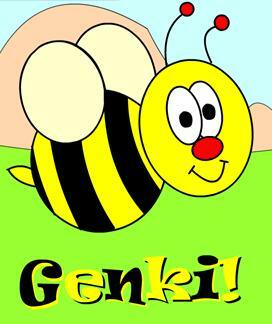 They are all huge fans of Genki English, as am I! I love the CD. I’m going to try the summer clothes song and game with my 4-year-old students because we started that unit last Monday. I love the I am a Robot song and will begin using it right away. I also am looking forward to using the Days of the Week song (I especially like the “What day is today?” version) and the shapes song. Recently my 4th graders asked to learn about school subjects in English, so I’m hoping to use the What time is it Mr. Wolf in combination with your new Subjects song. Brilliant work on this one. I thought CD 9 was your best, but this is SO GOOD! But I have gone on long enough. Congratulations on a terrific CD. I am going to have a lot of fun this week teaching! I love you program and the new songs are great. I love the way that you’ve incorporated Baby Monkey and the other characters into so many of the songs and graphics – it really makes the children feel like they already know the things when you do that! These supercharge me – great songs! Marvelous!!!! !I have been using them when you were creating them because my pupils love the videos were you are the teacher trainer and me too of course! and I don’t have words to say THANK YOU RICHARD, because pupils that have horrible marks in maths or language, they have and excellent mark in English. My partners ask me that it’s impossible they have so good marks in English and I always say: teach Maths in a genki way,teach language in a genki english, look for Richard and ask him. New software rocks!! I really loved it. I will start teaching my new students here in Brazil. Thanks for the GREAT opportunity to benefit from all that work that you’ve done. P.S. Lots of GREAT ideas to use! This is great! Also I know my students should love the music that goes along with the songs since some of them are similar to Korean pop music (the ones with a great electronic sound).! WOW!!! Another wonderful volume!!! Thank you soooo much!!! I like all of the themes, but my absolute favourites are the Treasure, Robot and Head, Shoulders themes. I will have sooo much fun with my kids with these! I plan on leaving them for October so we can use them for Halloween as well. I hope there will be a robot mask until then. Oh, and another thing about vol. 11: thank you for using Baby Monkey in the games!! My kids love it! Thanks again for another master piece, Richard and team! Keep up the fabulous work! We and our kids thank you. Songs are great – and I really like the idea of “hmm” feature in the songs. Looking forward to the materials for each song. Thanks Richard for all the great work you do! Please admit my congratulations on your new part of GenkiEnglish course! It’s a real feast! You’ve done it excellent from the psychological and methodological points of view. There are so many surprises for kids and hints for teachers! And placing the Japanese version is very cute to get teachers who doesn’t speak Japanese to remember what being a student feels like. Changing clothes to the kids’ taste is also very tricky as it makes them repeat the word “T-shirt”lots of times. Acting like having forgotten the sixth day of the week shows to the teachers what they need to do if their kids do not catch anything: simply to do it with them! Singing Head and Shoulders song adding one word at a time concentrates children’s attention on perception of the concept they already have in their native language and can predict it because they did the gesture many times before. The last but not the least benefit: the happy end of the Treasure Adventure! Dear Richard, this is a fantastic material, I enjoyed it a lot, my students were so happy yesterday, my daughter and one of my students did not want to stop dancing, I am a robot and what subject do you like. Thank you so much for all you hard work, you are a huge blessing for us. God bless you! Is Really great! I did not encounter any problem. I am teaching in a small village in the sierra madre of Michoacan, Mexico and to me all the genky english material is been a life saver. AWESOME!! It’s like Mc D…I’m lov’n it! I love Volume 11! The Summer clothes song is perfect to use right now as we are about to finish school and go on summer vacation! The Subject song is very popular with my older kids. We haven’t figured out all the gestures, but they love it. They want to get up and dance! 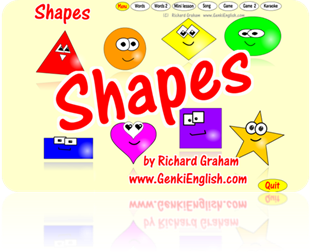 The Shapes is a needed study area and very helpful. The memory game is excellent in the shapes. I am also happy about more hip hop music that appeals to my older learners. 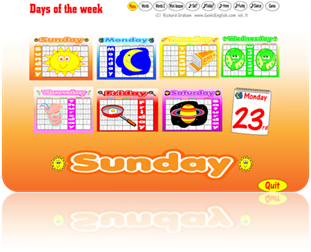 The Days of the Week Funky is great as well as is the robot music. 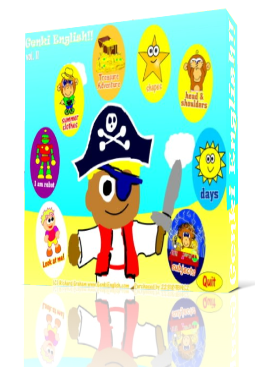 Pirates are nice with the movie coming out soon and good vocab and sentences. The only thing that was confusing was the Robot game. The first time through no one knew what was going on. I then studied the game and figured out that you are looking for the short o sound. Everyone is happy to see Baby Monkey back..It is great to keep the monkey theme going. All in all, it is a wonderful product. I had my last lessons for this school year yesterday…I obviously couldn’t resist trying the new material. take out- put away (take out your notebook — put away your notebook). And a few more so …TURN ON and TURN OFF were perfect and I introduced ” I AM A ROBOT” the kids went wild they just loved it. With the class I didn’t use the game…they were too excited and didn’t want to stop dancing…so to calm them I introduced the Treasure Adventure theme. I got them to sit down close to the computer and in the end they were all singing the song. Then in the afternoon with two private students (brother and sister) who usually don’t do the lesson together because they fight too much…the boy though older is not very good in English, unfortunately at school they run through the grammar with an Italian English teacher never repeating anything (he is in 4th grade and has done all the verb tenses including conditionals and he can hardly remember basic words ( numbers, animals, clothes, food, etc). His younger sister finds English easy and this gets him really frustrated. They also have a mother tongue conversation teacher who makes them translate just about anything and doesn’t converse with them…a total disaster! I go there and practically do homework with them (the parent don’t know English and can’t help them with homework)… and they have a lot of it. So while doing homework with the girl I turned on my computer opened the Genki menu told the boy to play around with it any theme he wanted all I asked was for him to repeat all the phrases or words he heard…he loved it! Once the homework was finished I made them play together with the “I am a robot” song and game. First just saying the words and choosing the right answer and counting how many mistakes they each made…when they got good at it and were making no mistakes. I had one do the oral with the computer and the other child had to write down the words he heard…they were really concentrated in their tasks (one in listening and pronunciation and the other in listening and writing) Obviously the girl got almost all the words right…and he was a bit frustrated..to ease the tension I had the mom try…it was quite interesting to see the kids reaction to the difficulty their mom had in distinguishing hot from hat etc…In the end they had great fun and were laughing, teasing and even helping their mom with the spelling of the words. Vol. 11 is currently in the Download Pack or Teacher's Set. There is also an Elementary School "Site License", have all the volumes on every computer in the school. Details are here. And vol. 11 is also included in the Homework Programme.